Gutters help to divert water on your roof away from the building into a drainage. However, even a small amount of debris can cause blockage on your gutter and prevent it from draining water properly. It is best to let a professional handle the job since the professional is fully insured. This means that in case a worker falls off the roof when they are working, their health expenses will be fully covered and you will not be liable. Philadelphia, PA gutter cleaning service providers also have the right equipment to do the job, so they are at less risk of getting injured while working. 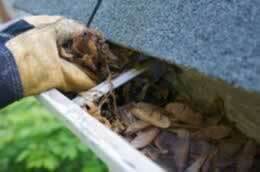 Our gutter cleaning Philadelphia, PA professionals will provide you with superior quality workmanship. We will assess the area and give you a free price quote outlining what needs to be done and the costs involved. Our Philadelphia, PA gutter cleaning professionals have received rigorous training, as well as field experience, therefore, you can be sure that our crew does a good job 100% of the time. Whether you need a small job handled or a large job, we are the most trusted Philadelphia, PA gutter cleaning service provider. We have completed thousands of cleans within the last few years. We are ready to help whenever you need our services.